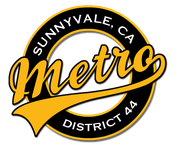 The Scores and Standing Pages are intended for Sunnyvale Metro families only. These pages are password-protected. Sunnyvale Metro parents who wish to view these pages may contact their team's manager for the password.